NEW - Bead, lampworked glass, transparent multicolored, 5-6mm round with confetti design and silver-colored foil with 0.6-0.7mm hole. 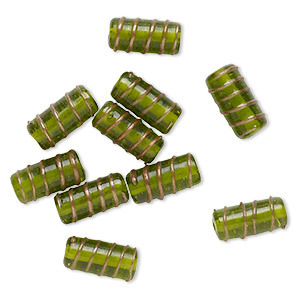 Sold per 1.5-ounce pkg, approximately 110-130 beads. 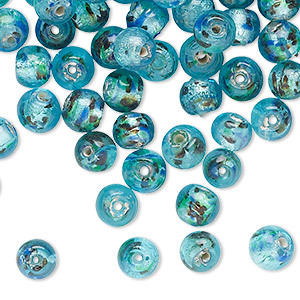 NEW - Bead, lampworked glass, transparent aqua blue, 5-6mm round with silver-colored foil and 0.8-1mm hole. 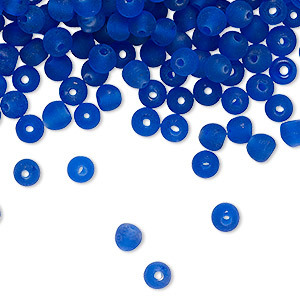 Sold per 1.5-ounce pkg, approximately 150-160 beads. NEW - Bead, lampworked glass, transparent aqua green, 5-6mm round with silver-colored foil and 0.8-1mm hole. Sold per 1.5-ounce pkg, approximately 130-140 beads. 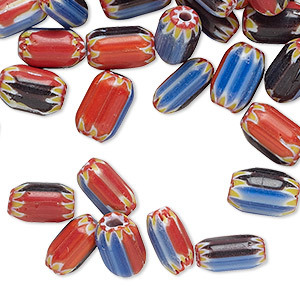 NEW - Bead, millefiori glass, opaque multicolored, 10x5mm-11x7mm round tube. Sold per 1.5-ounce pkg, approximately 75-90 beads. NEW - Bead, lampworked glass, translucent frosted orange, 6x4mm-7x6mm square tube. Sold per 1.5-ounce pkg, approximately 120-130 beads. 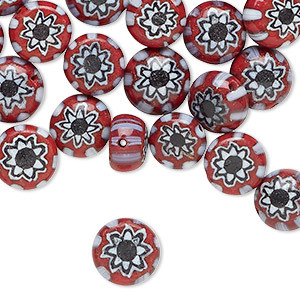 NEW - Bead, millefiori glass, opaque red / white / black, 8-10mm flat round with flower and line design and 1-2mm hole. 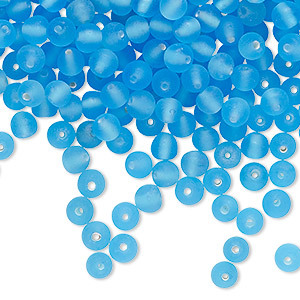 Sold per 1.5-ounce pkg, approximately 55-65 beads. NEW - Bead, lampworked glass, transparent light blue, 5-6mm round with silver-colored foil and 0.8-1mm hole. 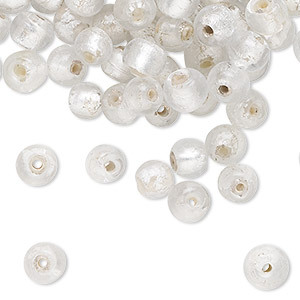 Sold per 1.5-ounce pkg, approximately 150-170 beads. NEW - Bead, lampworked glass, transparent clear, 5-6mm round with silver-colored foil and 0.8-1mm hole. 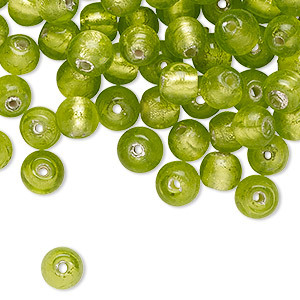 Sold per 1.5-ounce pkg, approximately 150-160 beads. NEW - Bead, lampworked glass, translucent frosted turquoise blue, 3-4mm round with 0.6-0.8mm hole. 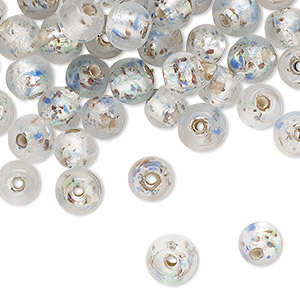 Sold per 1.5-ounce pkg, approximately 490-520 beads. 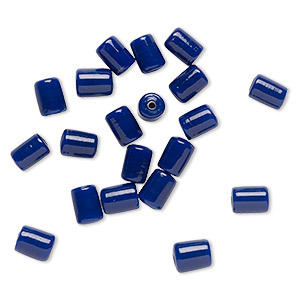 NEW - Bead, lampworked glass, opaque cobalt, 9x7mm-10x7mm round tube with 1.5-2mm hole. Sold per pkg of 20. 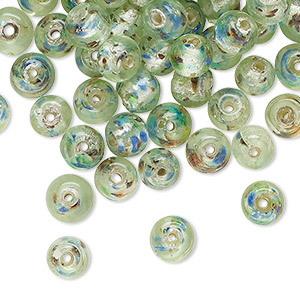 NEW - Bead, lampworked glass, translucent blue-green, 3-4mm round with 0.6-0.8mm hole. 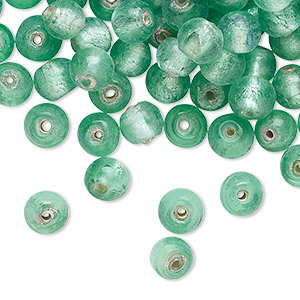 Sold per 1.5-ounce pkg, approximately 490-520 beads. NEW - Bead, lampworked glass, transparent multicolored, 5-6mm round with confetti design and silver-colored foil with 0.6-0.7mm hole. 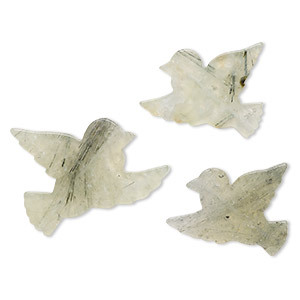 Sold per 1.5-ounce pkg, approximately 120-130 beads. 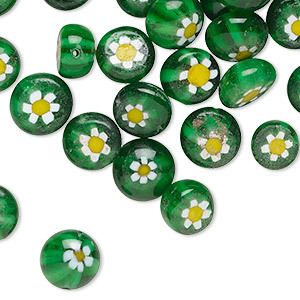 NEW - Bead, lampworked glass, transparent light green, 5-6mm round with silver-colored foil and 0.8-1mm hole. Sold per 1.5-ounce pkg, approximately 120-140 beads. 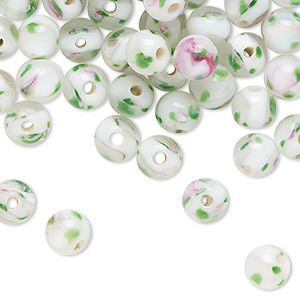 NEW - Bead, lampworked glass, opaque pink / white / green, 5-6mm round with flower design. Sold per 1.5-ounce pkg, approximately 120-130 beads. NEW - Bead, lampworked glass, transparent multicolored, 5-6mm round with confetti design and silver-colored foil with 0.6-0.7mm hole. Sold per 1.5-ounce pkg, approximately 120-140 beads. 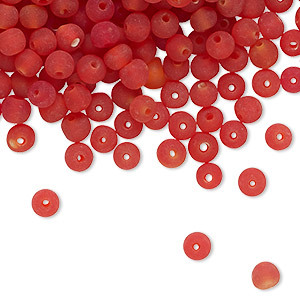 NEW - Bead, lampworked glass, translucent frosted red, 3-4mm round with 0.6-0.8mm hole. 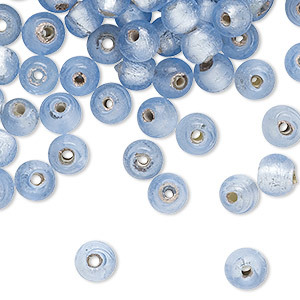 Sold per 1.5-ounce pkg, approximately 500-520 beads. NEW - Bead, lampworked glass, translucent frosted light turquoise blue, 3-4mm round with 0.6-0.8mm hole. 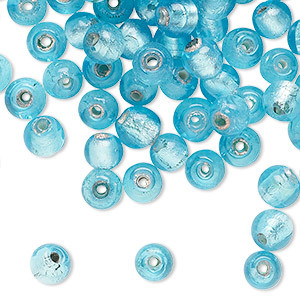 Sold per 1.5-ounce pkg, approximately 490-520 beads. 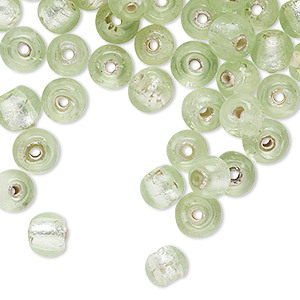 NEW - Bead, lampworked glass, transparent olive green, 5-6mm round with silver-colored foil and 0.8-1mm hole. 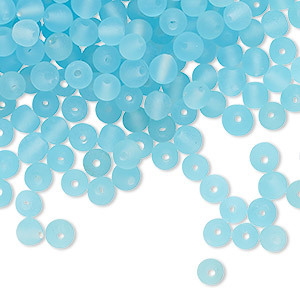 Sold per 1.5-ounce pkg, approximately 130-140 beads. 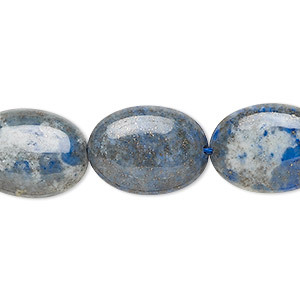 NEW - Bead, denim lapis (natural), 18x13mm puffed oval with 0.8-1.5mm hole, C grade, Mohs hardness 5 to 6. Sold per 15-inch strand. NEW - Bead, lampworked glass, transparent olive green, 22x10mm-23x11mm round tube with line design and copper-colored foil with 2mm hole. Sold per pkg of 10. 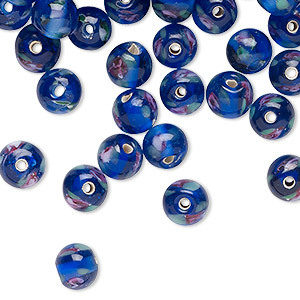 NEW - Bead, lampworked glass, translucent frosted cobalt, 3-4mm round with 0.6-0.8mm hole. 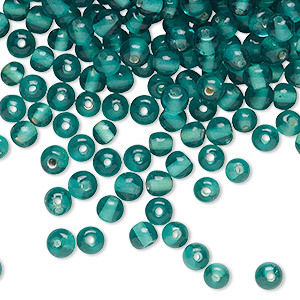 Sold per 1.5-ounce pkg, approximately 490-520 beads. NEW - Bead, lampworked glass, translucent multicolored, 5-6mm round. 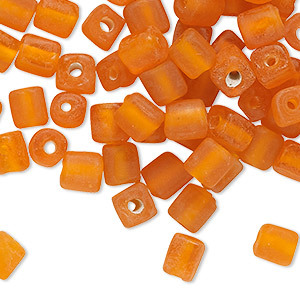 Sold per 1.5-ounce pkg, approximately 110-130 beads.